Discover the secrets of electricity while getting your hands a little messy! Using our special conductive dough, design your creature. Then, add lights, buzzers, and more to make your creature come to life! Aquatic Adventures at Turtle Bay are a great chance for all ages to learn about water ecosystems and the importance of the Sacramento River through a variety of fun interpretive programs, including underwater diver interactions, fish and beaver feedings, turtle talks, and training sessions. This summer, Turtle Bay is proud to partner with Shasta Humanity Project on their Tiny House Raffle. Come tour the tiny house at Turtle Bay’s McConnell Arboretum & Botanical Gardens on Saturdays and Sundays from 11-1 pm throughout July. Tickets are $100 and only 750 will be sold; the home - classified as an RV - is valued at $30,000. Proceeds support Shasta Humanity Project and their mission to inspire a spirit of hope to those without a place to live and return their sense of dignity through independent living. The beers were cold and the sun was hot this past Friday at our annual Brews by the Bridge event at Turtle Bay! We'd like to extend our gratitude to everyone who celebrated the solstice with us while also supporting Turtle Bay's educational programs and exhibits. Attendees from all over enjoyed this fun summer event featuring live music, local beer, food trucks, and games, held on the north end of the Sundial Bridge at Turtle Bay. With close to 700 in attendance, an enjoyable evening was had in benefit of our Park, thank you! COST: $10 pre-sale (ends 6/22) or $15 at the gate - Includes 1 Free Drink Ticket! Turtle Bay Exploration Park invites you to Brews by the Bridge on the Quarry Patio, near the north end of the Sundial Bridge at Turtle Bay in Redding on Friday, June 23, 2017, from 6:30 pm - 9:30 pm. Brews by the Bridge is the perfect way to celebrate the solstice with beer, live music, tasty food, and activities, all while supporting Turtle Bay's educational programs and exhibits. This is a 21 and over ONLY event. This coming weekend is your last chance of the season to experience Turtle Bay's popular Wings of Summer, Butterflies! Since its grand re-opening back in May of this year, The Butterfly House has opened the hearts and minds of members and visitors of all ages with over 32 species of butterflies in a beautifully re-designed garden enclosure. Come experience hundreds of butterflies up close and personal in their natural habitat! Free for members / included in Park admission. Supported by Dennis and Sherrill Bambauer, The McConnell Foundation, Doreeta Domke, Betty Fitzpatrick, Dutch Bros. Coffee - The Resner Family, Bruce & Michelle Lutz, Jerry & Sally Peters, Gus & Jody Petras, Trudy & Ernie Tavares, Bob & Sandie Morrison, and Steve & Nancy Williams. Mythic Creatures of all kinds have taken over the Turtle Bay Museum, open now through October 1, 2017! From narwhals to unicorns and manatees to mermaids, discover the connections between the real and mythical worlds at Turtle Bay this summer in Mythic Creatures: Dragons, Unicorns, and Mermaids! This hands-on exhibition come to Redding from the American Museum of Natural History in New York City, and is presented by Shasta Regional Medical Center, U.S. Bank and Dennis & Sherrill Bambauer and supported by Dr. Pamela Ikuta & Don Burton and Dutch Bros. Coffee – The Resner Family. Included in Park admission – FREE for members! Have you ever wanted to learn more about the Sundial Bridge and its history, construction and design? Ever wonder why it’s here and what it has to offer? Well now can by joining one of our FREE Sundial Bridge Tours. The bridge celebrates human creativity and ingenuity and is a technical marvel you have to experience for yourself. The next Sundial Bridge Tour takes place Saturday June 3rd at 10am. You’ll learn everything you want to know and more only at Turtle Bay! 10th Anniversary Walk on the Wild Side Animal Show! Hey animal lovers of all ages! The 10th Anniversary Walk on the Wild Side Animal Show opens this Saturday May 27 at Turtle Bay! Shows are 11am and 12pm, you won't want to miss this brand new edition presented by Redding Bank of Commerce. Free with Turtle Bay Park admission. From the Vault: Twenty Years. The Big 2-0! Saturday, April 12, 1997, Turtle Bay Exploration Park (Then Turtle Bay Museums and Arboretum on the River) opened its first new, post-merger attraction, Paul Bunyan’s Forest Camp. 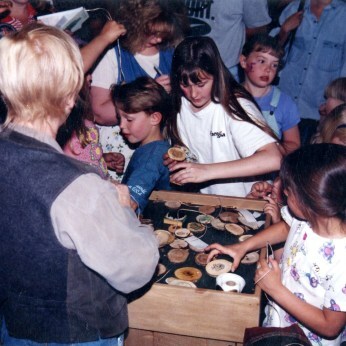 The free event launched the beginning of the Turtle Bay build out and was the first public physical manifestation of the hard work of The Forest Museum, founded 14 years earlier. The camp also provided a gateway for public access to the Interpretive Forest planted in 1992/1993. It was a wild day. We estimated that about 5,000 people streamed across the little boardwalk and through the gate in the hours after Paul Bunyan himself (okay, honestly, it was a really tall actor) cut the ribbon. Those first guests walked into a carnival atmosphere. 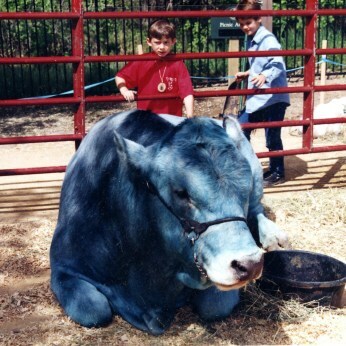 Paul’s famous companion, Babe the Blue Ox, was on site in a big red corral. The Dolbeer Steam Donkey was up and running under the tender care of John Nicoles and Jerry Harmon, who still work with demonstrating two person chainsaws for curious kids. Every available space had an activity set up, and there was plenty of food. It was my 13th day on the Turtle Bay staff. I’d been recruited straight out of grad school to help the Curator of Forestry, Linda Ragsdale, and the Forestry Educator, Jeanne Tomascheski, run the brand new Forest Camp. Almost the entire Turtle Bay staff turned out that day to put on the event, even people whose focus was on our other sites, the Redding Museum of Art and History, Carter House Natural Science Museum, and the Redding Arboretum. Paul Bunyan’s Forest Camp has changed quite a bit. In 1999, we opened the Butterfly House in the Interpretive Forest. In 2000, we moved the camp’s entrance when we opened the Visitor Center – soon to be the Mosaic Restaurant. The animal program re-located from Carter House to the camp in 2002. We started adding animal habitats to the Interpretive Forest five years ago and launched Wildlife Woods. The original playground and the water area on opening day – before the shade canopy. Improvements continue. The amphitheater has undergone extensive renovations twice and is getting more shade sails as I type. Over the years, we’ve rebuilt and refurbished the playground until parts were so worn that they had to be removed entirely as part of the extensive renewal project that is taking place in tandem with hotel construction. We are very excited about the new entertaining and educational experiences families will have in the modernized and expanded play area. The first kids to run through the front gate are adults now, and many of them bring their children to Turtle Bay. It has been an eventful 20 years, both for Turtle Bay and for me. In 2002, I was promoted to Collections Manager and moved out of my Mill Building office and over to the museum’s Collections Facility. In 2007, I relocated to an office in the Museum and took over curatorial duties. When I walk around Paul Bunyan’s Forest Camp, the biggest shock for me is the Interpretive Forest. Steady growth sneaks up on you. While gathering images for this blog, I looked at pictures of the trees in 1997 when I began taking kids on tours. Some of the taller trees topped 15 feet, but not many. Today, the Interpretive Forest is visible from a distance! The Interpretive Forest in December 1998 as we were surveying for the Butterfly House. Who knows what the future holds, but here is to twenty more successful years! Anyway, Sharon and I officially reported for duty on 2/20/16. We signed in excitedly in the gardens’ little office, selected our gloves (provided by the nursery) and headed to the greenhouse where we were greeted by Lynne Klocke (world’s best mentor and most patient person EVER). We were agog over the seedlings & plants in every stage of growth in the greenhouse. Lynne quickly put us to work. Our first assignment was… propagation! (Sharon & I looked at each other in astonishment and wonder and, yes… a little fear. What the heck?!) We learned that everything in the Turtle Bay Nursery & Gardens either comes from seeds, or through propagation (Webster’s definition: the breeding of specimens of a plant by root cuttings from the parent stock). No plants in Turtle Bay’s nursery or gardens are store bought. They’re all from seeds or via propagation; they’re drought-resistant, and California natives. We were amazed and impressed! After a quick lesson on how to do it, Sharon & I went to work propagating a pile of Mexican Bush Sage cuttings and propagated away until all our little cuttings were done and placed in the perlite soil, per instructions. When we were done with that assignment (smiling and quite pleased with ourselves), Lynne loaded us up with a few flats of plants (16 plants per flat) ready to be transplanted into 1 gallon pots, and sent us outside to the table under the canopy covered with a mountain of the most beautiful soil ever, where we transplanted our hearts out for a couple more hours ’til we signed out that afternoon, tired and happy and looking forward to the following week. Here it is, a year later… and I hope those little propagated cuttings worked, grew to be transplanted into gallon pots that were purchased at the Spring or Fall Plant Sales, and are thriving at happy new homes… maybe even at your home! More adventures and learning experiences to follow! The weather is warming up, the sun is starting to shine (sometimes) and flowers are starting to bloom! All of this makes a wonderful combination to do some science! In this project we’re going to create rainbow flowers. Cut the stems of the flowers so they are 10-12 inches long. (Have an adult help!) Using a sharp knife carefully cut a 6 inch slit through the bottom of the stem. Remove any large leaves. Be sure to keep the cut edges moist since exposure to oxygen will make the flowers wilt at a faster rate. Fill your jars with water and add between 10-20 drops of food color (or more depending on your preference). Place each separate stem end into a cup of colored water. Prop up the flowers so they don’t fall over. We had some fancy mason jar covers, but tape should work as well to help prop the flowers. Place the jars by a window and hopefully you will begin to see the first hints of color after a few hours, but wait 24 hours to see an even more dramatic change. Flowers go through a process called transpiration, where it releases moisture into the atmosphere. As moisture is released, more water is pulled up through tiny tubes in the stem called xylem. Water molecules have the tendency to stick together, so as one water molecules leaves the flower, it brings another one up with it. Did you like this activity? Then you might be interested in our single-day Spring Break Camp! Turtle Bay will be offering single day camps April 11th – 13th for children 7-10. Campers can register for one, two, or all three days. Each day will be different from the next as we cover matter, energy, and forces. All camps will feature hands-on and self-led activities that encourage collaboration and innovation. With all things hot and cold, campers will discover the states of matter and how they’re important to us. Some activities include changing milk into one of our favorite desserts to stacking liquids on top of each other! Campers will explore the sights, sounds, and properties of energy in many forms. From discovering the power from the sun to watching the effects of sounds, we will be learning all about the power or power! Though our superhero forces may be lacking, there are still many super forces to be explored! Campers will check out the unseen forces of our Sundial Bridge and see if they can explain the mystery behind magnets. Whether you have enrolled into one of our camp programs before, or if this is your first time hearing about them, we invite you to check us out! For additional information and registration forms, visit www.turtlebay.org/learn/camps. We have a limited space, so hurry! California residents know that when it comes to precipitation, it is often a matter of feast or famine. Currently, Redding is experiencing the feast after a relatively dry spell. We wanted the drought to end but not, you know, all at once! At 79,000 cubic feet per second, releases from Keswick Dam are the highest they have been since the El Niño/La Niña cycle of 1997-98. Heavy rains have flooded valley towns and aging infrastructure is threatened. We are, however, lucky this isn’t 1862. In that year flooding was terrible. A United States Geological Survey paper confirms newspaper accounts that the Sacramento Valley was a 350-mile long, 20-30-mile wide lake! Here at Turtle Bay, we are perfectly poised to watch the Sacramento River as it rises and falls with each controlled change in the release level and with every rainstorm. The plaza under the Sundial Bridge is underwater, but that has happened a few times since it was completed in 2004. The Turtle Pond on the trail on the north side of river is currently part of the river and last week the river began flowing over the south trail for the first time since it was paved, filling the wetlands behind the museum. February 13, 2017. The sign you can see in the 2011 photo is completely under water in the 2017 image. Before Shasta Dam, this area flooded regularly. One of the dam’s primary purposes is to control those floods. The flood of 1906 washed out the old Freebridge, south of the current Cypress Street Bridge. It was rebuilt and then damaged again the following year. Floods in 1909 and 1913 affected the roads and rail lines. High river flows in 1915 threatened to take out the Diestelhorst Bridge while it was under construction. The Diestelhorst in February of 1915. Rail line washout. This happened more than once before the dam was built. While Shasta Dam was being built, Redding experienced its last major flood, the devastating Flood of 1940. On February 28, 1940 the city was cut off by the floodwaters. The storms that month caused the river to peak at more than 185,000 cubic feet per second at the dam site. In his 1997 article for the Covered Wagon, engineer Clair Hill cites a 189,000 cfs maximum flow. Hill also noted that he remembers driving south to Sacramento through water two feet deep on Highway 99. On February 29, 1940, the Oakland Tribune reported that the river was up to six miles wide in some places near Redding. I have heard anecdotal reports that the water crossed the buffer of floodplain farmland and reached the downtown Safeway on Cypress and Market streets. The east abutment of the old Free Bridge washed away, the abutments of North Market Street Bridge were damaged, and both ends of the Diestelhorst Bridge were under water, effectively cutting off vehicle traffic both north and east. The new rail trestle over the river was badly damaged as well. In a 1994 Covered Wagon article, John Fitzpatrick recounts pushing a “borrowed” flat car of dairy products north across the trestle to replenish communities, such as Buckeye, that were completely cut off from the food supply. Sadly, that car was also used to ferry back the body of 19-year-old Irene Clement who had drowned in Salt Creek as the result of a car accident. Fitzpatrick reports that on the return trip, the trestle began to buckle as one of the supports gave way. They abandoned the flat car and carried Irene back to Redding. The Diestelhorst Auto Camp was destroyed in the Flood of ’40. As we know from this February, Shasta Dam only controls river flooding; it does not prevent it entirely. Nor does it prevent downstream flooding from heavy rains or localized flash flooding. River flooding severe enough to make news across the state has occurred many times since 1940. For example, the San Bernardino County Sun reported a 70,000 cfs release in January of 1953 that flooded homes, ruined a new dance hall, and flooded the Riverview golf course. In February of 1970, the Red Bluff Daily News announced that 14 northern counties, including Shasta, were to receive Federal Disaster Relief funds as a result of heavy flooding. The El Niño of 1983 brought February flash floods and high releases, as reported in the Santa Cruz Sentinel. What’s the moral of this story? Pay attention to the weather because Mother Nature bats cleanup and chin up, it could be 1862!